One would not think that the multicultural agenda would penetrate and distort with such malignant deceptiveness the actual history of mathematics, a subject that bespeaks of exacting precision and truthfulness, but it has happened; academics have imposed upon all Western universities the requirement that this history must be responsive to "groups historically underrepresented in mathematics." This is not new. For some decades now multiculturalists have been rewriting European history in such a way that the "customs, heritage, history, and other aesthetic aspects" of non-European immigrants are incorporated as "essential components" of what they deceitfully call "an effective educational program." The just cited words are taken from Multicultural Mathematics: Teaching Mathematics From A Global Perspective, published back in 1991. Fast forward to 2017, and you will find that "multicultural mathematics" are now a major educational staple of the West. 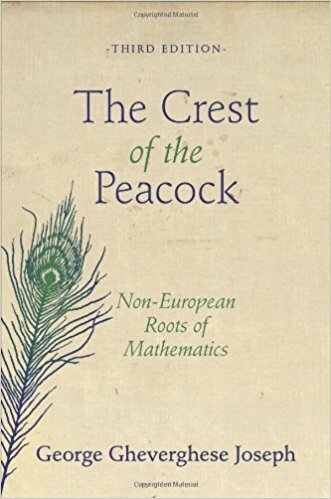 One of the authors of the book Multicultural Mathematics, George Gheverghese Joseph, professor at the University of Manchester, is also the author of The Crest Of The Peacock: Non-European Roots Of Mathematics. This book has been very successful: first published by I.B. Tauris in 1991, by Penguin in 1992, then reprinted three times, and eventually released by Princeton University Press in 2000, with a third edition released in 2011. According to Google it has been cited over 800 times, with great reviews in such prestigious venues as New Scientist and Times Literary Supplement, and mostly five star reviews at Amazon. To top it all, this book has its own unique entry in Wikipedia. a deep-rooted historiographical bias in the selection of interpretation of facts [wherein] mathematical activity outside Europe has as a consequence been ignored, devalued or distorted (Crest Of The Peacock, First Oxford Edition, 2000, p. 3). The history of mathematics cannot with certainty be traced back to any school or period before that of the Ionian Greeks. [Mathematics] finally secured a new grip on life in the highly congenial soil of Greece and waxed strongly for a short period...With the decline of Greek civilization the plant remained dormant for a thousand years...when the plant was transported to Europe proper and once more imbedded in fertile soil. ignores a considerable body of research evidence pointing to development of mathematics in Mesopotamia, Egypt, China, pre-Columbian America, India, and the Arab world that had come to light [by time Kline wrote his book]. Gheverghese's point is that, while the passage from 1908 may be excused, the view expressed in 1953 cannot be excused since much research was produced in the intervening years, making the Eurocentric model untenable. Gherverghese thinks it is time to propose a new model, and this is what he sets out to do, propose a model of the history of mathematics in which multiple cultures are shown to have played equally significant roles with "cross-fertilization between different mathematical traditions" happening at various points in time (pp. 5-9). We are supposed to believe that Gheverghese's model is complex, cosmopolitan, and nuanced, far superior to the simplistic, linear, one sided, parochial Eurocentric model. All multicultural revisionists make the same claims about their sophistication and their receptiveness to new research. Nonsense. The old research invalidates their claims, and the new research contradicts it. First, most of the books Gheverghese relies upon to construct his new model are authored by Europeans themselves, and the non-Europeans are either academics enjoying a great job inside a European university, or academics educated in European scholarly research. Second, the book by Rouse Ball published in 1908 is actually very cognizant of the contribution of non-Europeans. The title of this book is A Short Account Of The History Of Mathematics (PDF). Rouse Ball's point is not that the history of mathematics begin with the Greeks, but that it "cannot with certainty be traced back to any school or period before that of the Ionian Greeks." Why? Because only Europeans cared to write historical accounts of mathematics. To this day most of the histories of the achievements of non-Europeans have been written by Europeans. Third, the very Gheverghese who complains about the "neglect of Arab contribution to... mathematics" (p. 344), did not tell his readers that Rouse Ball's book has two long chapters, IX and X, with the titles: "The Mathematics Of The Arabs" and "Introduction of Arabian Works into Europe, 1150-1450." From this rapid sketch it will be seen that the work of the Arabs (including therein writers who wrote in Arabia and lived under Eastern Mohammedan rule) in arithmetic, algebra, and trigonometry was of a high order of excellence (p. 135). He writes about the limitations of their accomplishments only after carefully examining their contributions, which is normal, since the Arabs did not reach the level that modern Europeans would reach in subsequent centuries. Why would Gheverghese distort the scholarly contribution of Rouse Ball in this manner, assuming that no one would care to find out about its veracity? Because academics are committed to multiculturalism, and this ideology allows one to distort the truth, since it is based on false premises, and its aim is not scholarly but strictly ideological. The aim is to rewrite the history of Europeans in such a way that it is portrayed as a creation of multiple races so as to justify the arrival of masses of Africans, Asians, and Muslims. Fourth, Gheverghese thinks he has a powerful argument against the Eurocentric model by drawing attention to the distinction between the Classical period of Greek science (600 to 300 BC) and the post-Alexandrian period (300 BC to 400 AD), and then arguing that the latter period was also Egyptian simply because the city of Alexandrian, which was the city where the science of this period was nurtured, was in Egypt. He writes that one of the "most striking features" of this period "was its cosmopolitanism — part Egyptian, part Greek, with a liberal sprinkling of Jews, Persians, Phoenicians and Babylonians" (p. 8). But there is an inconvenient fact about this claim: all the known scientists of Alexandria were Greek in ethnicity. The School of Alexandria is known as the greatest mathematical school of ancient times. The foremost names are: Euclid, Eratosthenes, Archimedes, Ptolemy, Apollonius, and many other less known names. Some few years ago, Lucio Russo made much of the contributions of the post-Alexandrian period, or the Hellenistic period, in his book The Forgotten Revolution: How Science Was Born In 300 BC And Why It Had To Be Reborn (2004). The incredible contributions of the Hellenistic period have never been forgotten, in truth; every book I have read about the history of science and mathematics contains separate chapters (or sections) on this epoch, as an epoch. It has always been know that this was the period in which real science was born, rather than in the Classical Period, which was about natural philosophy. The object of this book is to advance the thesis that mathematics has been a major cultural force in Western civilization (1978 ed., p. vii). Since ancient Greek times, Europeans have been possessed by the idea that nature is characterized by regularity, design, lawful relationships and rational patterns, which the mind can know about, as a separate faculty of reasoning and objectivity, with a capacity for "pure thinking" in abstraction from bodily impulses and external contingencies, through the use of mathematics. This is why most of the history of mathematics is veritably a history of European accomplishments, which brings me to my last point of refutation. Sixth, the notion that before the publication of Gheverghese's book the history of mathematics was under the tutelage of a Eurocentric model that ignored the contributions of other civilizations is preposterous. Why did he chose a book from 1908 and one from 1953 to make his case that non-Europeans mathematics has been neglected (not that the book from 1908, as I showed, neglected non-Europeans)? Why did he not cite passages from Carl Boyer's A History Of Mathematics, first published in 1968? This book has chapters dedicated to "Egypt," and to "Mesopotamia," and to "China and India," and a chapter with the title "The Arabic Hegemony." Every book I have read and consulted on the history of mathematics has chapters on non-European contributions. In fact, we can go back to 1923 when D.E. 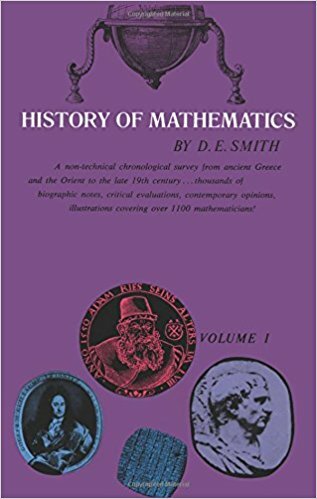 Smith's book, History Of Mathematics, was published, to find two opening chapters on non-Europeans contributions, and also one chapter, plus half of another, on "Oriental" mathematics. There is also a separate section on the contributions of the Orient in all the chapters on Europeans. How can Gheverghese, and the many others promoting "multicultural mathematics," insist that Europeans neglected the contributions of others? Why do they keep repeating this when it is the other way around: Europeans were the only ones who wrote and acknowledged the contributions of others? The ideological reason is that multiculturalism is about enforcing cultural equality, about justifying the occupation of European lands by non-Europeans, and about giving the impression that non-Europeans are not only to be welcomed but have also been co-creators of the culture of Europeans. But if our concern is to write accurate histories of mathematics, we cannot but give far more priority to Europeans. Boyer, for example, has four chapters on non-Europeans, and 24 on Europeans, because Europeans did contribute a lot more to mathematics. That is just a fact, and if we are to write a proper history, Europeans must be paid more attention. But multiculturalism does not care about mathematics, about the truth; it cares about promoting other cultures inside the West and bringing about the destruction of Whites. D.E. Smith, I might add, co-authored a book on Japanese Mathematics, which goes to show that he cared about the contributions of non-Europeans, as has always been the case with Europeans, the authors of almost all the books on non-Europeans. The basic arguments that Smith presented in History Of Mathematics, in 1923, is still valid. He offered an opening chapter on Egypt, Mesopotamia, China, and India, as "pioneers in mathematical development before 1000 BC." Then he offered chapters on the contributions of the Classical and the Hellenistic Greeks, from 600 BC to 400 AD, roughly speaking. He did not have much to say about the Orient for this period simply because "so little was accomplished in the Orient from 1000 BC to 300 BC" (Dover ed., 1958, p. 95). Egypt developed a worthy type of mathematics before 1000 BC and then stagnated, Babylonia did the same, and China followed a similar course (p. 96). He did recognize, however, that "the period from 300 BC to 500 AD was one of developmental activity in China" (p. 138); and that during the "five centuries from 500 to 1000 AD...Europe was intellectually dormant" (p. 148), and that during this same period "there were four or five mathematicians of prominence in India" (p. 152), as well as some prominent Chinese mathematicians. While it can be argued that he neglected the contributions of Muslims, and believed that the Arabs were "transmitters of learning rather than creators," he did offer sections on the "greatest mathematicians" during the Islamic ascendancy from the eight to the fourteenth century. He also said that, in China, the five centuries from 1000 to 1500 AD "were the most interesting" in the history of mathematics (p. 266), though he then qualified this overtly generous statement and restricted Chinese creativity to the thirteenth century only (p. 269). In Asia the gloom was particularly oppressive in the 16th century. India was intellectually dead [...] The introduction of Western civilization into India, China...is interesting because of its diverse effects. As to India, mathematics was already stagnant, and the European influence gave it no stimulus...China, which had done so much in algebra, was content in the 17th century to adopt European astronomy while allowing her own undoubted abilities to lie dormant [...] Except for the case of Japan, the Orient lost its initiative in mathematics...India produced nothing that was distinctive in the 18th or 19th century. China, while occasionally protesting against Western mathematics, in reality sacrificed on the altar of the Jesuit missionaries her own originality in the science (pp. 350, 435, 533). 1791-1871 Charles Babbage, British: Designed a "difference engine" that could automatically perform computations based on instructions stored on cards or tape, forerunner of programmable computer. 1811-1832 Évariste Galois, French: Proved that there is no general algebraic method for solving polynomial equations of degree greater than four, laid groundwork for abstract algebra, Galois theory, group theory, ring theory, etc. 1928-2014 Alexander Grothendieck, French: Mathematical structuralist, revolutionary advances in algebraic geometry, theory of schemes, contributions to algebraic topology, number theory, category theory, etc. 1937- John Horton, Conway: British Important contributions to game theory, group theory, number theory, geometry and (especially) recreational mathematics, notably with the invention of the cellular automaton called the "Game of Life"
The same pattern of immense European creativity can be observed in every other endeavour. Why this has been the case, why Europeans are responsible for almost everything great on the universe, requires an explanation. I have attempted some explanations in The Uniqueness of Western Civilization and Faustian Man In A Multicultural Age, but more analysis and historical reflection is necessary, particularly in light of the fact that multicultural historians are trying to distort, hide, trash, and lie about these achievements.